Two friends, bitten by the itinerant bug and armed with little more than a Norton 500 motorcycle and the carefree craze of youth, embark on a journey across a continent. Nothing exceedingly extraordinary about that. The human spirit of adventure has seen a lot of heroic trips being undertaken by daredevil travellers. Yet, what is it about the journey of these two Latin American friends that pulls curious onlookers like me to follow their trail to this day? 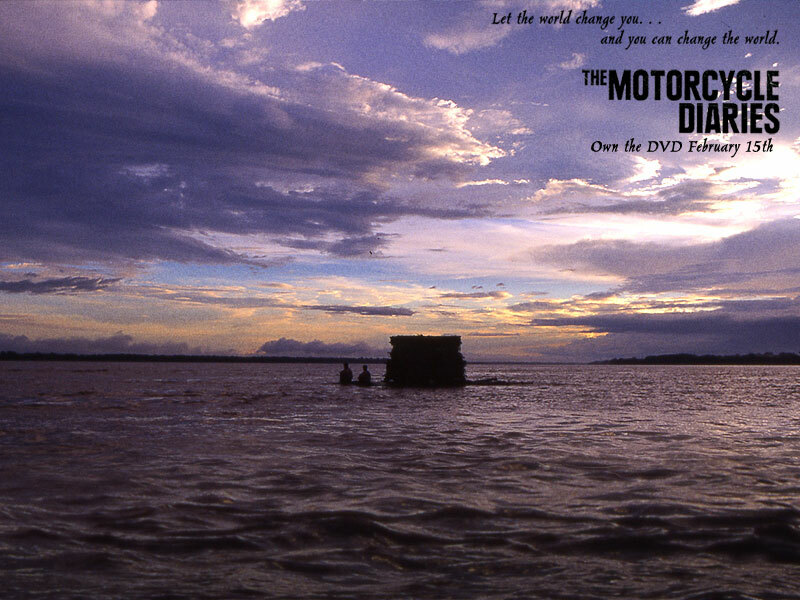 What is it about The Motorcycle Diaries that makes such a lasting impression on me and so many others? The fact that it isn’t just a travelogue, nor is it just another memoir of youthful impulsiveness; but that it’s a man’s inner journey happening hand in hand with the outer sojourn. It’s also your own journey—as a reader and as a person. A bit surreal to describe in words. This is not a story of incredible heroism, or merely the narrative of a cynic; at least I do not mean it be. It is a glimpse of two lives that ran parallel for a time, with similar hopes and convergent dreams. Indeed, Ernesto Guevara hits the nail on the head there, at the beginning of the book. 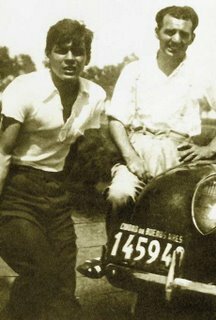 When I first read The Motorcycle Diaries some three years ago, I knew little about Guevara. He was this t-shirt and poster figure, the epitome of “revolution.” I only knew him as a left-inclined man who stood and fought for the rights of the oppressed. In hindsight, it’s a good thing that The Motorcycle Diaries, and not one of his political pieces, was the first Guevara writing I came across. The book surprised me. For, here I saw a 23-year-old young man, going on 24, just like any other of his age—bursting with restless energy and the spirit of quest. I saw this young man poking fun at himself, his older pal, and their often unfriendly motorcycle. I found little or none of the political rhetoric that Ernesto Guevara came to be associated with, just a few years since making this defining road trip. And layer by layer, chapter by chapter, I saw the young man changing, until the end of the nine-month journey, when he seemed to have come of age and matured way beyond he could have imagined at the outset. 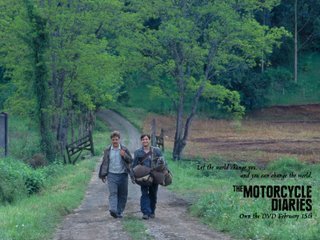 And then last month, just like he had done three years ago with the book, my brother gave me the DVD of The Motorcycle Diaries. I had pestered him a lot to bring home the movie. Yet, when it finally arrived, I didn’t show any urgency to watch it. I let it lie until my brother rang an alarm bell saying the DVD was a friend’s and had to be returned. That’s when I finally watched it. Why this lack of interest? Did I think the film would be boring? No. I just felt sceptical about the movie because I wasn’t so sure the book could be adapted for celluloid without a measure of documentary-like info-dumping. And even though the book is written chronologically, it still has this scattered and fragmented persona, which I thought would make a film made from it less cohesive. And this is why they say, don’t think about it based on what you read. Go, watch the film. The silver screen version of The Motorcycle Diaries moved me just as much as Guevara’s own words had. In fact, there couldn’t be a better rendition of the book in film format than the one we now have from Director Walter Salles. It stands out for all the elements that define fine filmmaking. Besides being technically slick, it impacts the viewer at a very human level. That is where it’s real victory lies. It entertains you wholeheartedly yet leaves you uneasy by posing difficult but nagging questions through young Ernesto’s observations. The breathtaking scenery first. Guevara himself does a fantastic job of describing the spots he and Alberto Granado pass by and visit during their epic journey through five South American countries—Argentina, Chile, Peru, Colombia, and Venezuela. The manner in which he shows a human intimacy with the immediate landscape can put a lot of fiction writers to shame. He talks of the sea as his confidant and friend that can absorb all secrets and offers the best advice, if only you carefully listen to its various noises. That the filmmakers chose to shoot the film at the exact locations where the journey took place doesn’t just enhance its credibility, but also makes for exhilarating visual treat. Cinematographer Eric Gautier superbly captures the scenic charm of the places on his camera, often giving the viewer the feeling of being there with Ernesto and Alberto. And the landscapes covered are magnificently diverse—from the green of Argentina, to the Atacama Desert in Chile, to Peru’s mountain tracks. I seriously want to see Latin America based on what the film portrays. 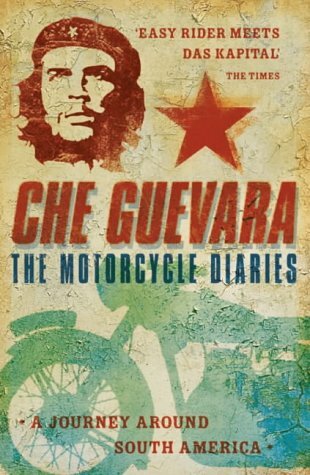 The Motorcycle Diaries is a testimony of Guevara’s brilliant sense of humour, something he is said to have possessed until the very end, even when he turned into a hard-boiled guerrilla fighter and a mass leader. Alberto, unmovable, was resisting the morning sun’s attempt to disturb his deep sleep, while I dress slowly, a task we didn’t find particularly difficult because the difference between our night wear and day wear was made up, generally, of shoes. Toward the end of the book, Ernesto lays out a neatly chalked-out “anniversary” routine he and his friend had devised to manage some food off unsuspecting people. The five-step program started with the two friends talking loudly with some local twang thrown in to pique the curiosity of those around them. A conversation would ensue, and our peripatetic friends would subtly enumerate their hardships on the road and then one of them would ask what date it was. As soon as someone told them the date, the other friend would let out a massive sigh, saying softly it had been a year since they started their journey, and they couldn’t even celebrate, they were so broke. Their “victim” would then offer some money, which the duo would refuse, before finally accepting it with reluctance. Their host then treats them to drinks. After the first drink, Ernesto refuses another one. The host persists, asking why he wouldn’t have another one, and after much requesting, Ernesto confesses that according to a custom in Argentina, he can’t drink without eating alongside. In the film, actors Gael García Bernal (Ernesto) and Rodrigo de la Serna (Alberto) portray the “anniversary” act hilariously before a couple of Chilean girls, about their age. I was in splits watching the duo performing their antic, mischievous innocence and the desperation to fulfil their stomach’s cries leading them to stand-up comedy brilliance. However, what set both the book and the film completely apart are the pertinent and often not-so-easy questions about the human condition. 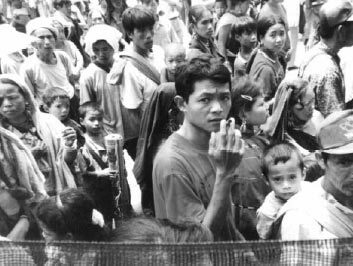 As Guevara and Granado travel farther and deeper, they have a close brush with the lives of the poor and exploited. This becomes possible because of the tramp-like nature of their journey for the greater part of the trip, since their bike breathes its last at a location in Chile. 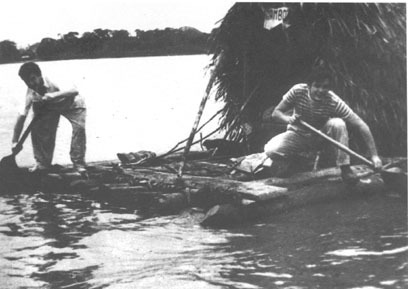 As they hitchhike their way through the Latin American landscape, a lot of times aboard trucks laden with indigenous people, Ernesto realises the tremendous humiliation meted out to poor people across the continent—whether it be a mining couple they meet in Chile who are persecuted for the man’s “communist” leanings, or the abject conditions to which Peru’s native mountain tribes are relegated, or the hapless state of leprosy patients they visit at the San Pablo leper colony in Peru. Every instance of coming across such injustice pains young Guevara and his anger and frustration is reflected throughout the book. Director Salles brings out this sense of pain very well in the film. It isn’t unnatural for a human to feel moved or sad at the plight of a fellow human. Most of us would feel the same emotions that Ernesto does. However, there are a few human beings, for whom the pain becomes so intense they can’t remain silent about it. Even though the book is primarily a record of Guevara’s and Granado’s journey, you can see Ernesto belongs to that rare breed of empathising human beings. Yet, the maturity doesn’t happen overnight. The self discovery happens layer by layer, and here, the filmmakers pull it off with great sensitivity, without the slightest trace of sensational exaggeration. The symbolic nine-month journey is also a tale of immense physical grit. The two friends brave harsh blows of nature—from walking through a completely uninhabited stretch at pitch dark, to trekking their way through forests and the Atacama Desert, even as Ernesto falls prey to a series of asthma attacks (he was chronic asthmatic). The Motorcycle Diaries includes a few letters Guevara wrote to his parents. These lend a fresh dimension to the book, reflecting his close bonding with family members with whom he freely shares his disenchantment with the appalling conditions of the poor across Latin America. Although it’s difficult and unfair to pick sections of the book as favourite, the parts I found the most chilling were those in which Guevara envisions a future for himself exactly as it unfolds years later. Early in the book he says his destiny is to travel. Indeed, in the succeeding years, right up to his death, he travels and travels—across the world—from Russia to Asia and Africa. Only now he is shorn of youthful indulgence and is a champion for the voice of the proletariat. And again at the end of the book, in the very last chapter, “A Note in the Margin,” Guevara gave me goose bumps, when he predicted his death. 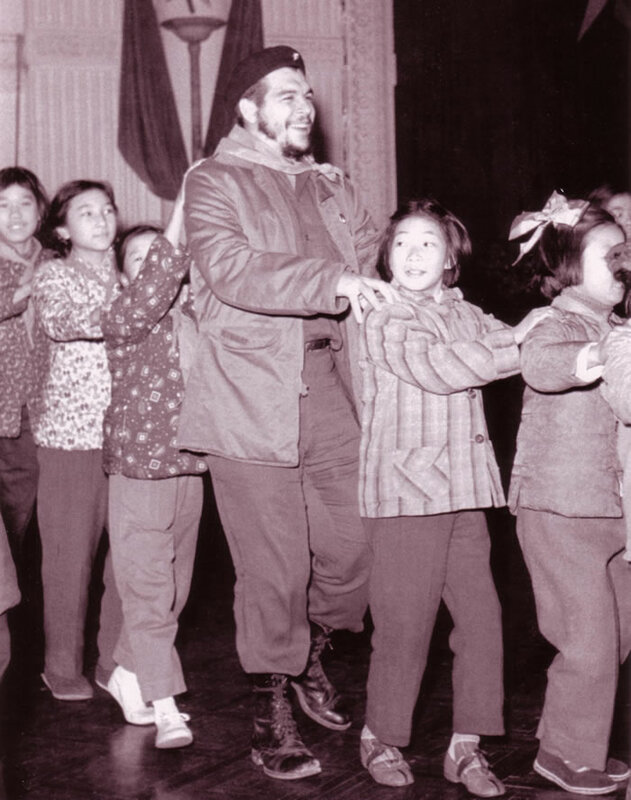 As insensitive as it may sound, perhaps it was only fitting that Guevara died young. He remains a youth icon through generations, although it’s sadly ironical that the ideals he stood for are now mere footnotes in history for the very people who use merchandise bearing his image. Ernesto Guevara would be 78 today (June 14). In my opinion, people like him don’t die. Only their bodies perish. Happy birthday, Che. 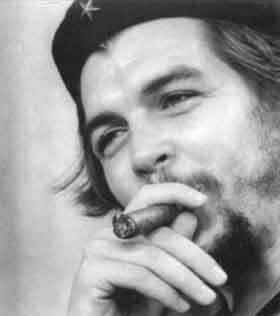 And a useless bit of trivia: Ernesto Guevara shares his birthday with yours truly. How old am I? 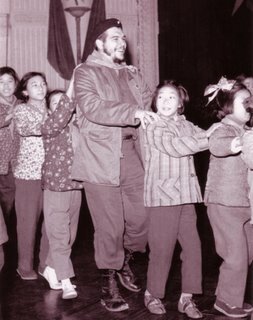 Let’s hope like Che, forever young. Thanks for a wonderful post ! Che remains so lovable, and so contemporary. Recent developments in Latin America only reinforce the relevance and the need for Che- in his empathy for the poor, the ‘insulted and the humiliated’, as Dostoevesky termed them.Brought back memories.Wish you a Very Happy Birthday !You are lucky to share it with Che. How can I avoid checking this movie out after such a glowing review. I still don’t know a thing about the man, but I know he is a darling of the Hollywood crowd, which has always given me pause. Happy Birthday, Happy Birthday, dear Bhaswati! :)Thank you so much for the wonderfully written reviews. I have always been intrigued by Che and after reading your reviews I find myself wanting to rent the movie at the earliest. I would have preferred to read the book first, but time is short at the moment, so I will have to start with the movie. Can’t wait! Lotus and Scott, I forgot to mention this. 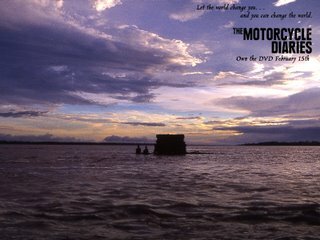 You may want to check out the official website of the film here:http://www.motorcyclediariesmovie.com/home.htmlIt features trailers, still photographs, part of the soundtrack, and other interesting information on the movie. Just a heads up. A slightly belated Happy Birthday! How ironic that you’ve given us the gift of this lyrical and literate review. I had no idea Guevara had written such a book. I’ll keep my eyes peeled for the video, too. Isn’t it sad that someone who loved life and people ended up resorting to violence, which ends people’s lives? Thanks, Georganna. Do see the film if you can; it’s wonderful. Like I mentioned earier, Guevara’s method of armed resistance to bring about a just society remains arguable. While I, by no means, condone violence, sadly, sometimes that’s the only option left for people who have been oppressed and denied a life of dignity to which every human being has a birth right, for ages. 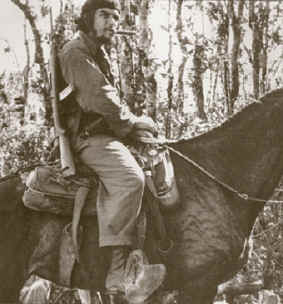 Since Che became a voice for such helpless poor people, he motivated them to take up arms to let their voices be heard. A revolution becomes imminent when voices are suppressed for centuries by those in power. Oh, I missed your birthday, Forever Young. 🙂 Hope it was great.Thanks for this post – now I want to go out and get the DVD. >revolution becomes imminent when voices are suppressed for centuries by those in power.Bravo, compañero, for the spirited defence of Che and the distiction between the violence of the oppressor and the (counter) violence of the oppressed.Che lives ! Thank you, Esther :). Let me know how you like the flim if you do get to see it. BS, Amen, friend. Happy (belated) B’day! !I loved the movie. It brought back memories of the time when I used to have a motorcycle and drive around the country-side. 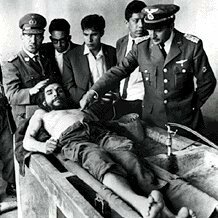 Unlike Che’s the roads I took were more frequently traveled.I wish Che had chosen a non-violent approach to the apathy towards poverty stricken Latin America. His violent uprising only justified the CIA sponsored hit which killed him.